American mountain ash trees (Sorbus americana) are grown in planting zones 3-8 and reach a maximum height of 30 feet, with a similar spread. Their fall foliage color is yellow. This deciduous tree provides spring and summer interest, as well. In spring it produces flat-topped clusters of small, white flowers. Those blooms give off a rather foul smell, but they do yield to clusters of vibrantly-colored red berries in the summertime. These specimens are indigenous to Eastern North America and are not particular about the soil pH of the ground in which they grow. The plant is best grown in full sun. You may be surprised to learn that it belongs to the rose family. 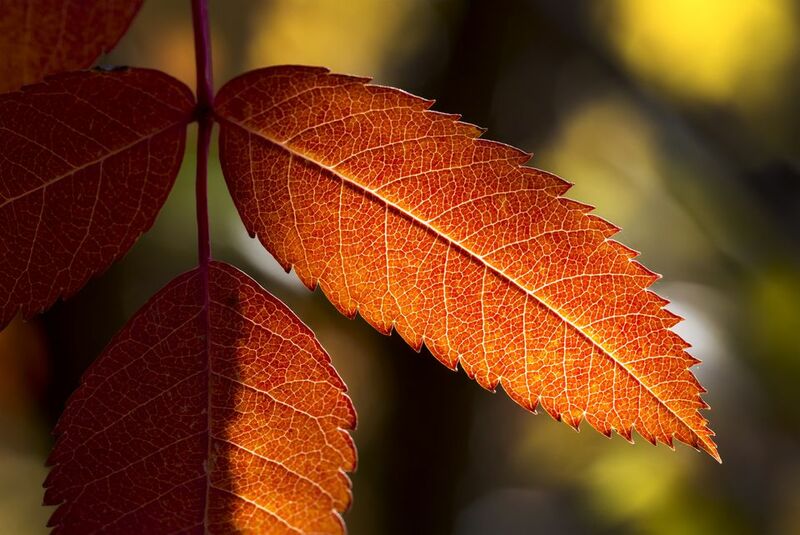 The rest of the plants covered in this article belong to the genus, Fraxinus (as opposed to Sorbus, the genus to which American mountain ash trees belong). White ash trees (Fraxinus americana) can be grown in zones 3-9. This is another Eastern North American native deciduous tree. Much taller specimens than American mountain ash trees, white ashes reach 70 feet tall on average, with a similar spread. They prefer full sun and rich soil but, like mountain ash trees, can thrive in soils with a wide pH range. White ash trees like a lot of water and prefer good drainage, but they will tolerate clayey soils. Summer foliage is dark green on top, but with a very light color on the underside of the leaf—thus the common name. Fall foliage color on many specimens begins as yellow, then morphs to purple (picture). They are especially attractive when they are at an in-between stage: a mix of yellow and purple. However, the fall foliage of white ashes (and the Fraxinus genus generally) can be short-lived. Another drawback: You will have to plant this one away from the house to avoid potential property damage. The branches of white ashes are not strong enough to withstand high winds or ice accumulation, and, when they break, you want them to fall harmlessly to the ground (not on your roof). A cultivar has been developed that will stay somewhat more compact (an important consideration for small yards). Called 'Autumn Purple,' it grows to be 45-60 feet tall, with a spread of 35-50 feet. Green ash is native to North America and grows in USDA planting zones 3-9. It has yellow fall foliage. This specimen, at maturity, can stand as tall as 70 feet, with a spread as wide as 50 feet. The red and black types reach similar dimensions and grow across the same USDA zones; the leaves of these native-American trees, too turn yellow in fall. Blue ash is as large as these other North American ashes but not quite as cold-hardy (listed to zone 4). Its species name, quadrangulata references the fact that the new branches start out squarish in shape. It provides no fall color worth mentioning, according to the Ohio Department of Natural Resources (Forestry Division). You may have noticed that some of these plants have been given common names that cite a color. As has been explained above, "white" ash is so called due to the lighter color of its leaves' undersides (compared to the tops). But what about the black, red, green, and blue types? Well, according to The Friends of the Wild Flower Garden, the first has been dubbed "black" because of the dark color of its buds. Similarly, Illinois Wildflowers observes that the young twigs of red ash bear a reddish-brown color, so this is likely the source of the common name. Meanwhile, the "green" kind seems to have received its common name by default. That is, the two sides of its leaves are roughly the same shade of green, so "green" apparently seemed a good name to use to distinguish it from the white ash. The origin of the name for the "blue" type is the most interesting of the lot: The fact is, one is actually capable of extracting a blue dye from this tree. Of all the ashes, it is the European ashes (Fraxinus excelsior) that are most famous in literature (although, as with blue ash, the fall color is unimpressive). These giants can grow to be over 100 feet tall, with a similar spread. In Norse mythology, a particular European ash tree called "Yggdrasil" supports the very universe. But just as the Norse gods are doomed to succumb eventually to their foes, the Giants, so even this tree is not invincible. A terrible serpent gnaws at its root in Niflheim, and the great ash someday will come crashing down—and, along with it, the universe. The Fraxinus genus is in the olive family.